The bagua octagon helps determine where certain energies reside in your home. Using a feng shui bagua octagon ensures your analysis will be accurate. Reading a bagua is easy once you understand its symbols and how each octagon wedge is applied to your home layout. The baqua (pronounced ba-gwa) or pakua (pa kua) is divided into eight wedges called trigrams (stacks of three lines either solid or broken). The baqua is only one tool used to create the complex feng shui analysis of your home or business. You combine it with a Flying Stars Analysis (based on the year of construction for your house or office and the direction it faces). In classic feng shui (Form and Compass Schools) the bagua's importance is secondary to the Flying Stars Analysis. The bagua is used to locate energy in your house yet it is not accurate for your individual best directions. To understand individual directions, you need an Eight Mansions and a Four Pillars of Destiny analysis. 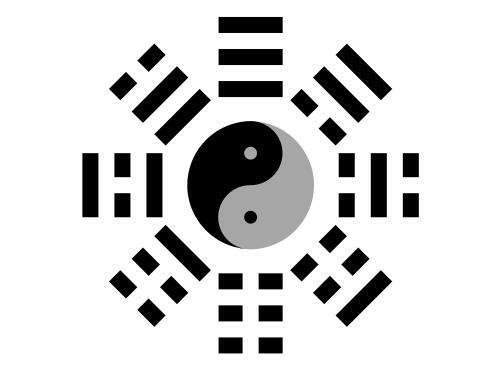 Western culture has adopted feng shui, however many people don't probe beyond the Black Hat Sect (Form School) which relies purely on the bagua. Using only the bagua octagon to make design choices and place features or cures in a home can be disastrous. For example, you may place an aquarium in the southeast (wealth) corner of your house believing it will enhance your finances. It works, and then suddenly you experience financial losses. What happened? The flying stars were auspicious in the southeast when you first added the aquarium, but these move like real stars and change positions with the seasons. What was once good chi became sha chi or si chi (bad chi). A water feature in this sector then strengthens the invading negative chi. In Form and Compass feng shui, a Flying Stars Analysis (a series of numbers) and a bagua are overlaid on your house blueprint. The bagua is lined up to the house's facing direction. This is determined by taking accurate compass readings and calculating the direction of your house. You can read a bagua octagon by studying each of the eight trigrams. 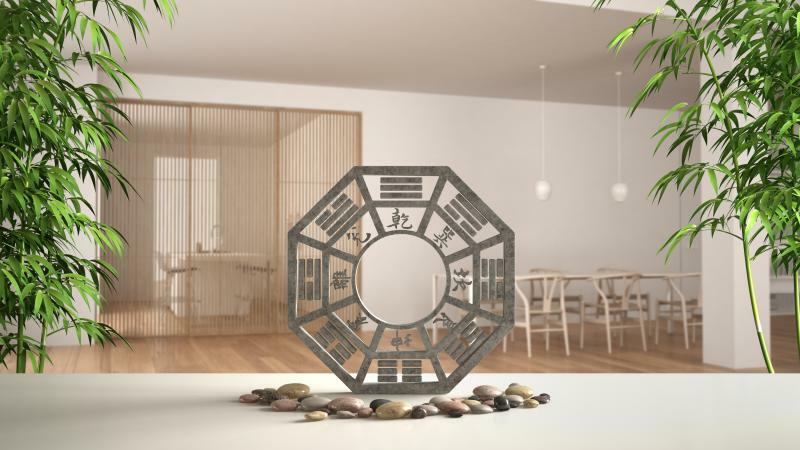 The bagua octagon shows you how to create a better flow of chi energy in your home. You will notice each trigram (wedge) has three lines. Some have more solid links while others have more broken lines representing different patterns of yin and yang. The solid lines represent yang and the broken lines symbolize yin. A trigram with more solid lines than broken is a yang trigram. The eight sides of the bagua represent areas in your life and correlate to a fixed direction. The bagua never changes, however if you live in a south facing house then move to an east facing house, your front door will no longer be in your Fame and Fortune sector but your Health and Family direction. The octagon shape represents the four main magnetic directions: north, south, east, west and the four in between: northeast, southeast, northwest, and southwest. Assigned to the main directions are colors, areas of life, number designations, and four celestial animals. The other four directions have the same kind of designations except for the animals. The bagua is representative of the cycle of life and its elements. The wind element is the chi (also spelled ch'i or qi). It is the energy of all living matter. Earth is located in the center of the bagua octagon. The cycle begins with fire burning wood, the wood in turn feeds the fire, and from this interaction, the earth (ash) is created. Earth then turns into metal (ore) under the heat and draws moisture from the air, which falls to the ground. Water then nourishes the wood, which fuels the fire, and the process starts all over again. Never ending. This process creates wind (chi) which aids or inhibits the elements. Without all of these elements in proper place, the cycle becomes broken and the wind cannot flow freely. Life becomes blocked, diseased and out of sync. That's why you want to be sure that you don't accidentally interrupt this cycle. A good way to remember the cycle is to test the elements against each other. If they have destructive or adverse effects on each other then you know they are not properly mixed. For example, water will extinguish fire and earth can smother fire. Earth makes water muddy. Fire melts metal and so on. Below is a chart to help you understand the properties of each direction and the elements and colors assigned to each. As in all things associated with feng shui, there are good common sense reasons behind what at first appears to be mysterious and even superstitious. The reason the south is considered best for a house or farm placement is logical. South facing property will receive longer hours of sunlight, which in turn will produce a higher crop yield. The bagua octagon can help you take advantage of these applied scientific principles.